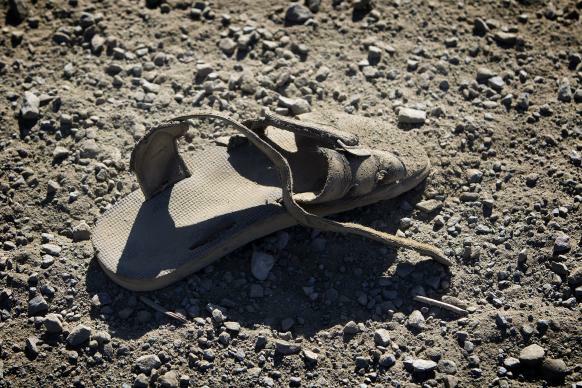 An abandoned sandal lies just across the border from Mexico near Friendship Park in San Diego. The Rev. Bill Jenkins, pastor of the Christ United Methodist Ministry Center in San Diego, and other church leaders are gearing up to offer shelter to hundreds of migrants gathering at the border seeking asylum. The migrants reached the border after a months-long journey, fleeing their homes in Central America because of violence. The group of about 300 began their trip to the U.S. in March, traveling atop freight trains, hitchhiking and walking. So far, fewer than 50 have been processed by U.S. Customs and Border Protection, according to news reports. Jenkins said as the mainly women and children are processed and allowed into the U.S. they will be welcomed to come and live at the center while they wait for court dates. Image from “The Migrant,” an animated video produced by United Methodist Communications, created by Chocolate Moose Media. In the interim, the Rev. Guillermo Navarrete, a pastor with the Methodist Church of Mexico, is tending to the people on the Tijuana side of the border. He said donations of food and clothing are being collected and volunteers are spending time with the children. Jenkins has experience with helping large numbers of people seeking shelter. In 2016, over 5,000 Haitian refugees came through the doors of Christ Ministry Center. From that experience the church created GateWAY Loft and is working to create a Safe Harbors Network. Jenkins explained Safe Harbors is an alternative to Sanctuary churches that provide shelter for refugees facing deportation. “Many congregations are unable to make that level of commitment but they still want to help,” he said. Speaking about the migrants, Jenkins said, “The one word I would share with you about their condition is traumatized. Gilbert is a multimedia reporter for United Methodist News Service. This story originally appeared at www.umc.org/news-and-media. It has been used with permission.